19 Kids Experiences you’ve probably never heard about, hidden in Wine Country! Parents on the look out for new and fun outings with kids, won’t usually be looking towards the Granite Belt – a destination full of wineries and romantic couples getaways… but here’s 19 reasons why they should be! We’ve uncovered a list of fun and cool things to experience in and around Stanthorpe on your next weekend or school holidays (and it’s all just 2hrs from Toowoomba and about 3hrs from Brisbane and the Gold Coast). 1. Scramble Through the Caves of a Bushranger’s Hideout! This could be your kids’ most exciting adventure on the Granite Belt and it’s totally free! It’s called Donnellys Castle… and let’s clear it up from the start, it’s not actually a ‘castle’. 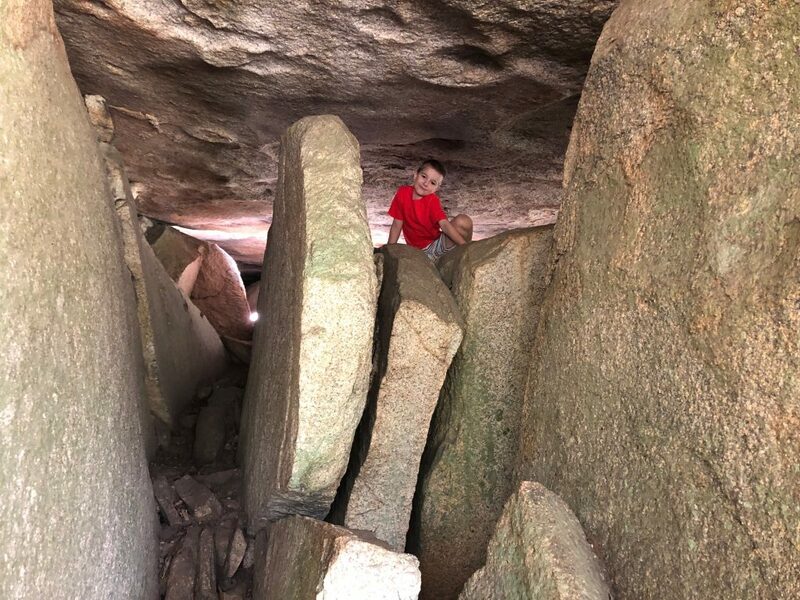 It’s a quiet picnic grounds sited next to an absolute wonderland of huge rocks, with cave-like entrances and narrow crevices – a hidden gem that’s fun to explore! Donnellys Castle is famously the site used by bushranger ‘Captain Thunderbolt’ as his hideout. There’s also an exciting lookout sited on the top of one of the granite outcrops, which is really quite unique and has lovely views. The caves, crevices and lookout are all less than 100m from the carpark, so its easy to access and the fun starts as soon as you arrive. There are toilets and a few (a bit aged) picnic tables. It makes for a great spot for a picnic morning or afternoon tea. Parent’s Tip: Tell the kids their mission is to find a yowie (there is a big yowie painted on a rock within the crevices and caves). Younger and older children will all enjoy this adventure, but parents do stay close with the kids as there are a few spots where extra care should be taken in watching your step. FIND IT: 15 minutes drive north west of Stanthorpe. On Donnelly’s Castle Road (you can use Google Maps to find your way). Don’t be put off by the short stretch of unsealed road or lack of signage for this place – it’s worth it! If your kids are budding chefs with all that Masterchef-tv inspiration, give them a real-life opportunity to see a chef in action. 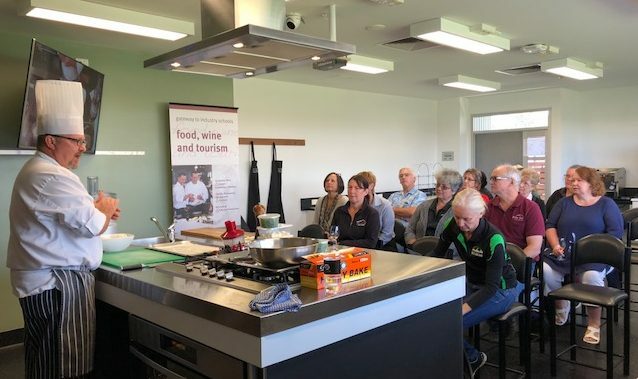 A guided tour of the Queensland College of Wine Tourism features a cooking demonstration in their new display kitchen with a chef or apprentice chef. There’s even a delicious tasting of the finished product at the end! The parents shouldn’t miss out on some perks on a kids day out, so they an enjoy the wine tasting included at the end of the tour, in the purpose built ‘Tastes of the Granite Belt’ room, while the kids relax on the lounges overlooking the vineyard or run around in the grassed courtyard within parent’s full view. Parents tip: Let the kids know in advance that the vineyards that surround the College are special ones for research and they can’t walk in these ones. For an opportunity to walk in the vineyards visit one of the many wineries and cellar doors. 3. Try a New Skill – Leather Stamping! Usually a saddlery is a place you either go, to you or don’t… but here’s a new reason to head to a saddlery, specifically Kent’s Saddlery in Stanthorpe. 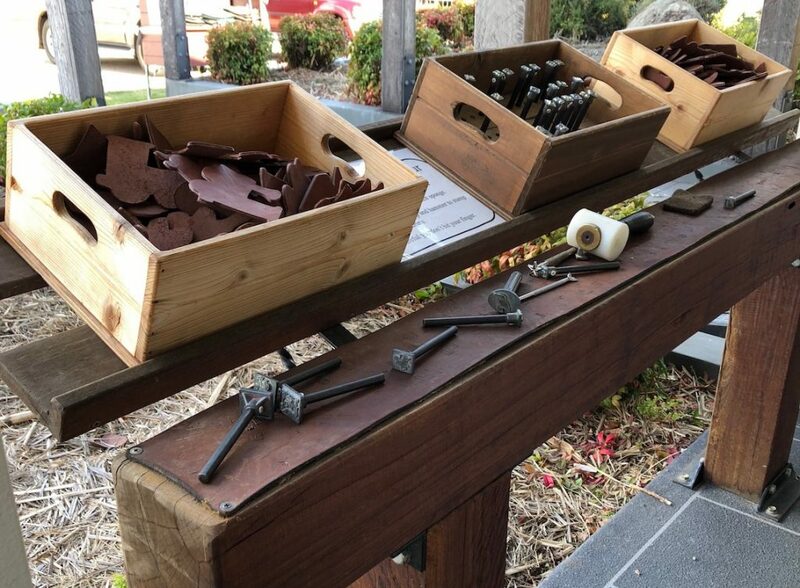 Outside the front of the saddlery store there’s a leather stamping station for kids, set up with various shapes of off-cut leather – in fun shapes like hearts, trains and dinosaurs. It’s set up with simple instructions and all the tools needed for embossing your own leather shape to take home. There are decorative designs and letters of the alphabet to choose from for stamping onto the leather. It’s all free for the first two shapes and after that it’s $1 per leather shape used. Also outside the saddlery you’ll find some cute farm animals, so it really is a family friendly stop and the parents can look inside at the top quality crafted bags, belts and more more made onsite. Parent’s tip: Stay close by to instruct the kids to be careful not to hit their finger. Kent’s Saddlery is super easy to find, it’s right next to McDonalds. Let’s face it, a trip to Egypt with the kids is not going to happen… so we’ve found you a much closer alternative. Kids are short, so any pyramid is going to look huge and exciting to them anyway isn’t it?! 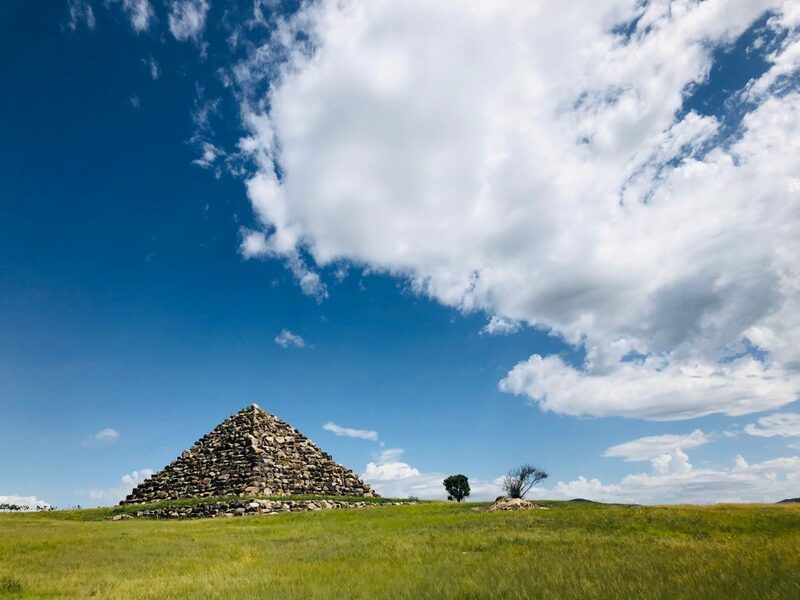 The Ballandean Pyramid really is a curiosity, sitting 17.5m high in the middle of a farm paddock in the quiet countryside. The pyramid is on private land, but there’s a spot to stop on the roadside about 25m from the pyramid for a close up look and a photo. Parents tip: Fun photo opportunity with the kids – have them pretend to be holding the pyramid up with their hands under it, or grabbing the top of the pyramid to lift it up. FIND IT: Located 21kms south of Stanthorpe near Ballandean. In Ballandean, turn off the highway onto Eukey Road (eastward towards the Ballandean Tavern), then turn immediately right onto Jacobsens Road. Follow Jacobsons Road for 1.7km until you reach the giant pyramid on the right. 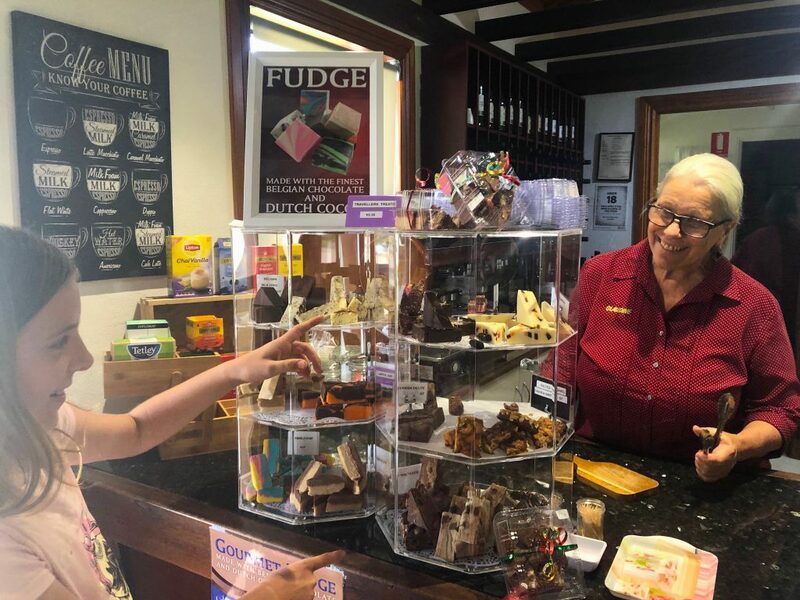 While most of the Granite Belt is all about wine tasting, Mason Wines also have Queensland-grown olive tastings, locally made chilli tastings and fudge! 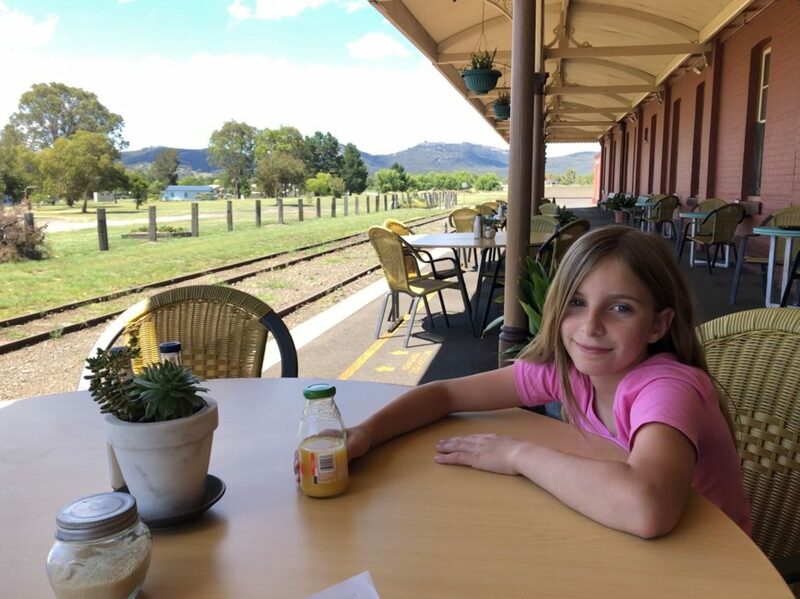 It’s a great family-friendly stop along the highway between Stanthorpe and Ballandean, where the parents can taste wines, while the kids enjoy the fudge or lunch at their cafe. Try a few fudge samples before you buy a stash to take with you on the road. As parents it can feel like we’re always forking out dollars to keep the kids occupied, so it’s super nice when you discover something unexpected for free. 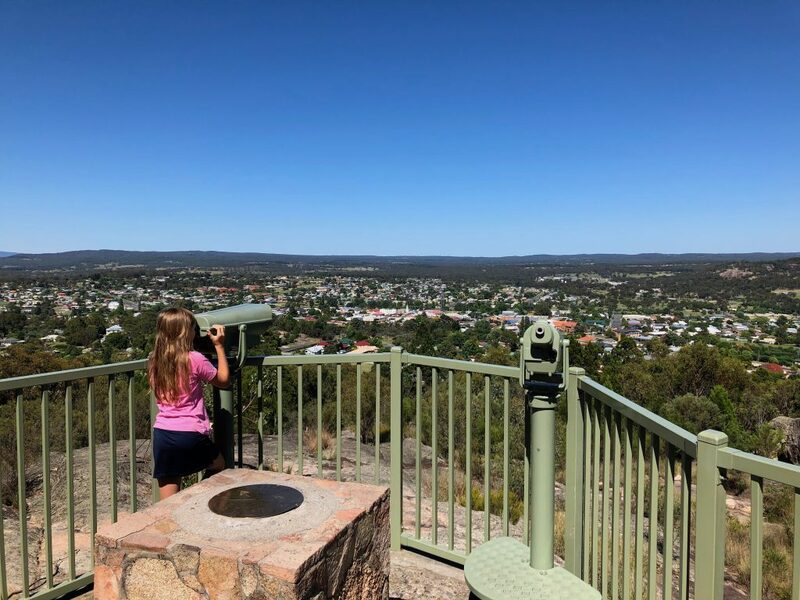 Head to Mt Marlay Lookout in Stanthorpe where the lookout over the town has free to use mounted telescope and binoculars (no – way, these things are never free at lookouts!). They work really well and it’s a nice bit of fun before heading on the short walk around the summit. We say ‘Hidden Walk’ because there’s no sign to say so, but there is a walking track leaving from the carpark that can be followed on a short circuit walk around the summit of the mountain. The narrow concrete track gives access to a granite outcrop with lovely views towards the north, then meanders through trees for filtered views the whole 360 degrees around the summit, before joining back to the road and carpark. Parents tip: Do a toilet stop before heading to Mt Marley as there are no facilities there. FIND IT: Not far from the town centre in Stanthorpe. Mt Marley is on Lock Street, Stanthorpe. 7. Play in the Snow! Stanthorpe is the coldest place in Queensland and so what better place to play in a snowfield, ice skate and see giant snow globes! 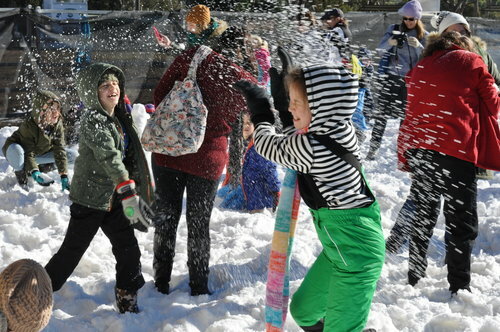 There’s so much fun to be had at Snowflakes in Stanthorpe from 5 – 7 July 2019! It does get cold enough to snow in Stanthorpe, but not every year, so artificial snow is made for a massive snowfield and ice for a skating rink created for a weekend of wintery fun! Find out more. 8. Bushwalk to the Granite Arch! Girraween National Park is really an exciting playground for a family adventure with its giant granite boulders, rock pools and so many walking tracks! 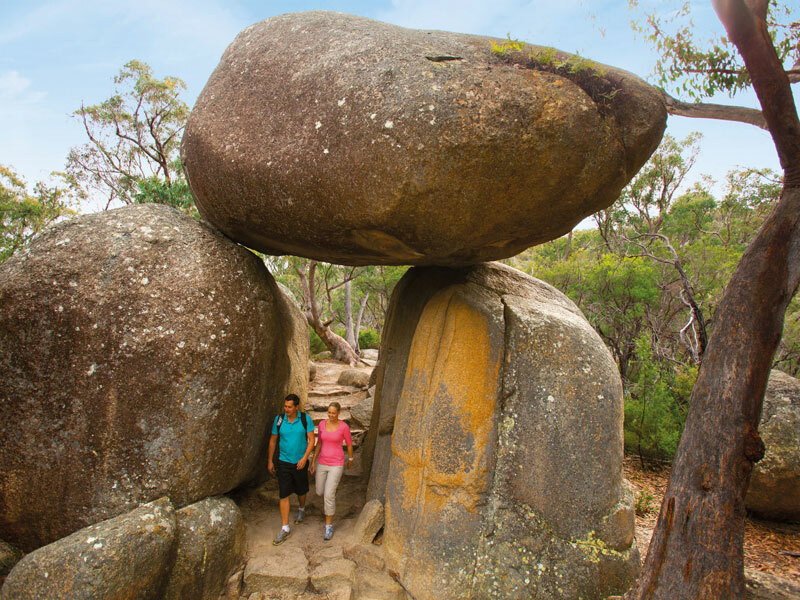 Of the 14 bushwalking tracks, a handful are really kid friendly and the Granite Arch is a favourite with families. On your way to the Granite Arch you’ll walk by Bald Rock Creek with it’s interesting shapes carved by the water into its rocks over the years and then cross its across a narrow bridge. From there you’ll then complete a circuit through the forest and gaze in wonder at the many giant round boulders along a 30 minute walk (1.6km return). If your kids are older and up for a challenge, there’s the spectacular climb to the top of the first pyramid for an awe-inspiring view and to see the most incredible giant 10 tonne balancing boulder right on the summit top! Find out more about the walks and information about which are easier and which are more challenging. 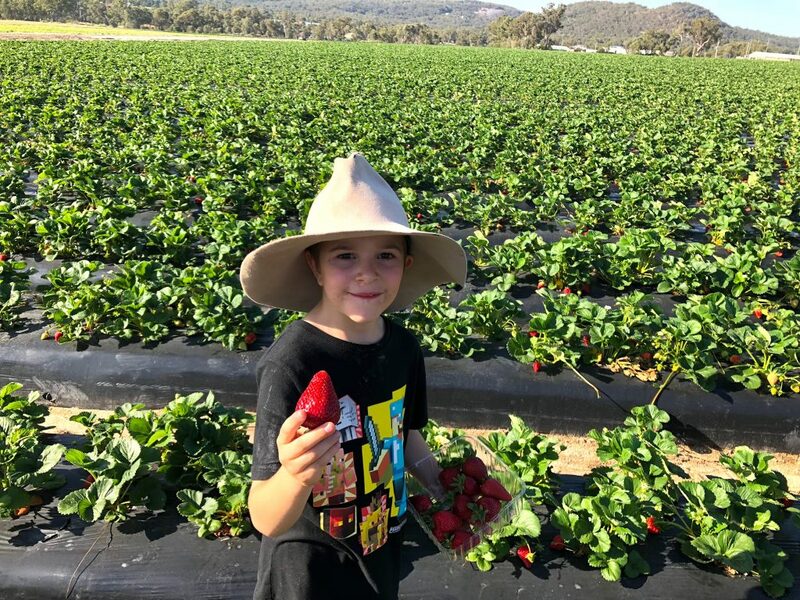 Ashbern Farms is a commercial strawberry farm in Stanthorpe that offers pick-your-own strawberries and it’s here the kids can get hands-on, helping find and pick their favourite shaped and sized strawberries in the patch. [Strawberry season is October to May]. Nothing compares to the taste of ripe strawberries picked straight from the patch and eaten still warmed by the sun! Get your container from the farm cafe and head out to the patch, where you can challenge the kids to find the largest strawberry for a bit of fun. There’s a set of swings and lovely grass for the kids to run around on, so grab a coffee, maybe even a strawberry waffle and sit outside where you can steal some quiet moments to yourself enjoying the peaceful view of the strawberry fields. Parents tip: The strawberry ice cream made right there on-farm really is divine, so time your visit with treat time. Also have a chat to the kids as you’re arriving, prepping them not to eat the strawberries in the field – let them know you’ll be taking them back to the shed first to be weighed. OPEN: 10am – 4.30pm Wednesday to Sunday during strawberry season, which is October to May. 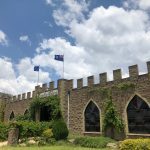 Playing a game of eye-spy or spotto with the kids is a must on any country drive and a great place to spot interesting sights is along Amiens Road, to the north of Stanthorpe. Turn off the New England Highway at ‘Thulimbah’ area onto Amiens Road (it’s hard to miss if you are looking for the turn where The Big Apple is!). Along the 3km stretch of Amiens Road from the highway to Stanthorpe Cheese Factory, you’ll spot The Big Apple, a faux Castle (Castle Glen is a winery/liqueur-maker inside a large medieval style faux castle building) and beyond that find lovely apple orchards on each side of the road before you reach the Cheese Factory (where there’s cheese tastings inside if you’re keen). 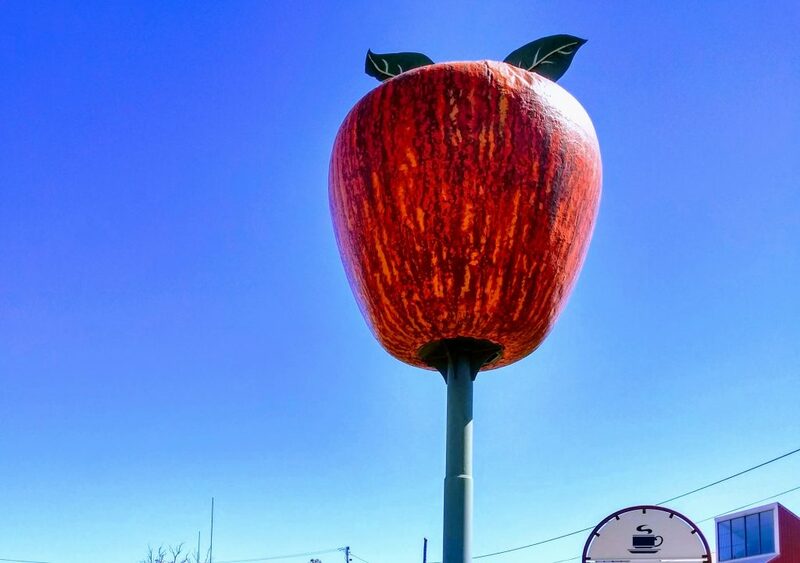 Parents Tip: There is a carpark at the big apple, where you can stop and grab a fun photo with the kids pretending to eat the Big Apple, or pretending to hold it up! Castle Glen is an impressive sight for the kids, but venturing inside Castle Glen for a visit may not prove easy with younger kids, as there are literally hundreds and hundreds of bottles of fascinating coloured liqueur, all within grabbing reach. You’ll know your kids best and whether this will work for your family. It’s free admission and only $2 per mini-bucket of animal feed for a whole lot of family fun at Granite Belt Christmas Farm. Here they grow thousands of real Christmas trees and you can walk through the avenues of trees and smell the fresh pine! 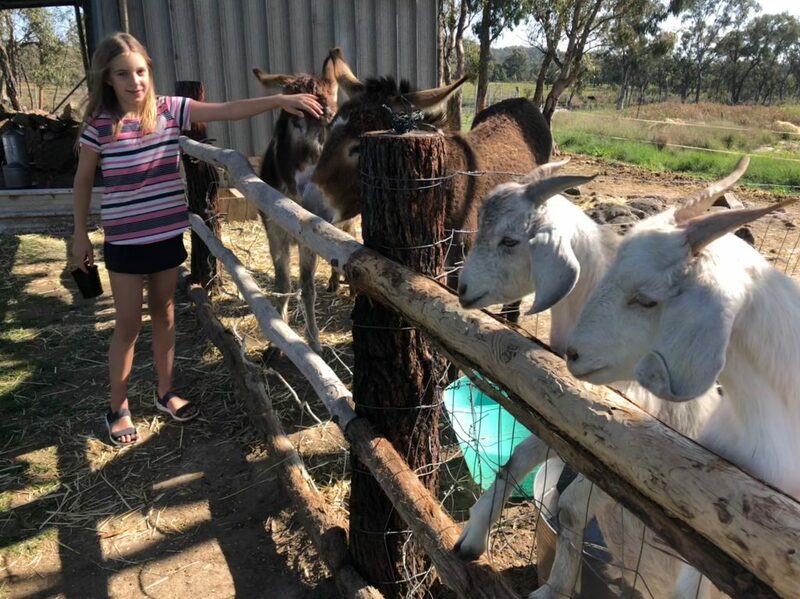 But for the kids, Santa’s animals are always the highlight, including reindeer, gorgeous donkeys, some very eager goats, sheep, ducks and chooks. Stepping into the Mistletoe Christmas store is a must, as it’s a wonderland and amazement in itself and it’s here you can be tempted with their yummy Belgian hot drinking chocolate and other Christmas themed delights. OPEN: Open March to January. 9am – 4pm Wednesday to Sunday. Train stations are just cool and having lunch right on the station platform is a fun family choice. The historic Wallangarra Railway Station & Museum in Wallangarra is only 15 minutes down the road from Ballandean and Girraween National Park. 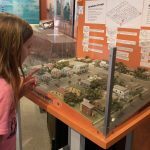 Check out the model villages and railway displays at the museum inside the railway station (admission is free) and then enjoy the family friendly cafe menu while dining at one of the many tables spread across the vast platforms, on both sides of the station. 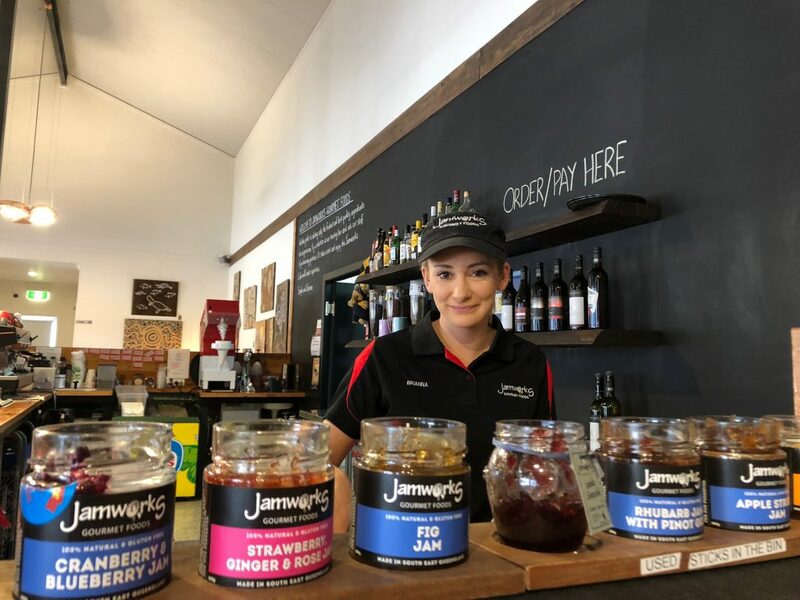 As far as popular cafes go, you can’t go past Jamworks Gourmet Foods Cafe & Larder where the menu and atmosphere is really family friendly and the food… it’s the real deal, made onsite from local Granite Belt produce! They have a product tasting bar (with paddle pop sticks) for yummy samples of their sweet jams and tasty relishes – a fun activity for finding a new spread for breakfast toast or school box sandwiches. They’ve got super delicious indulgent milkshakes amongst the many options on the menu – their Mars Milkshake really tastes like a Mars Bar, yummy! Parent’s Tip: If your kid are old enough to not grab things off the shelves, visit next door at the Candle Store and challenge them to find a candle scent name that will make them laugh. One of the many candle scents displayed on the shelves is called ‘Monkey Farts’! Mother’s Day gift idea? haha! 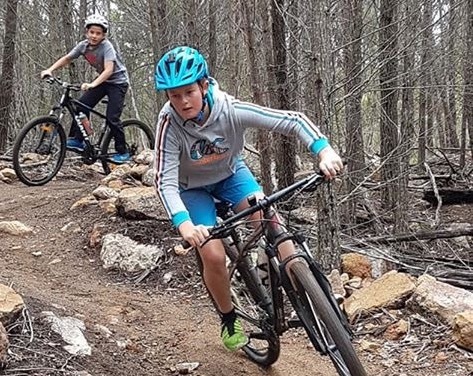 Get the kids out in nature and active on Stanthorpe’s fantastic family friendly mountain biking tracks! They just opened in 2018 on Mt Marlay and one out of the four mountain biking tracks is especially suited to beginners and families. The ‘Green Granite’ trail is graded ‘green’ level difficulty, meaning it’s suitable for people with little or no experience to have a go. There are also ‘blue’ and ‘black’ graded tracks and the ‘blue’ one named ‘The Grape Escape’ could be a suitable challenge for teenage kids looking for a bit more excitement! Find more details about the trails. 15. Visit a winery… say WHAT?!?! 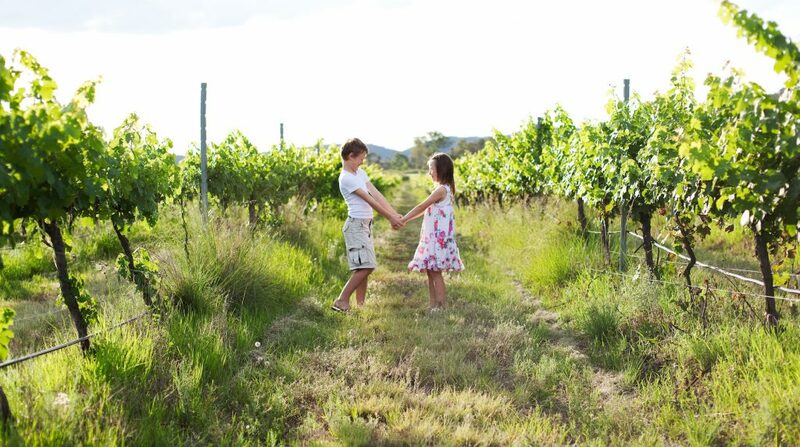 Yes you heard us right… lots of the Granite Belt wineries and cellar doors are kid-friendly and the kids can walk through the vineyards to see the grapes growing or learn about the various stages of the vine’s growing process. 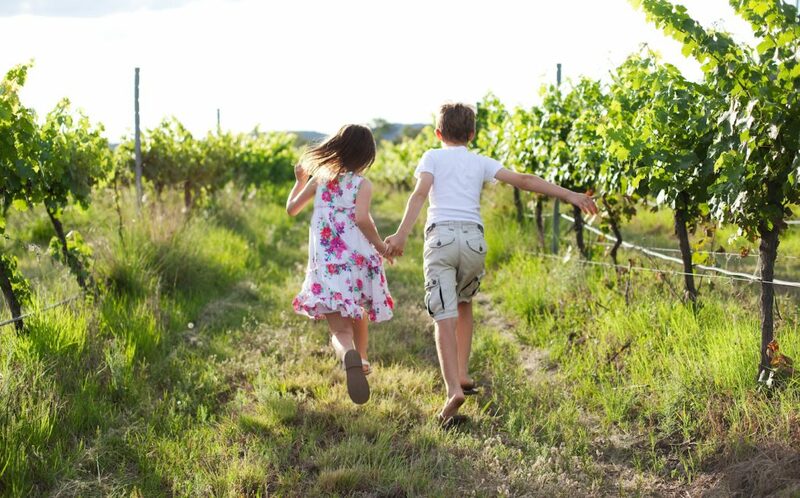 While the parents are cellar door tasting, the kids can spend a while running around on the grass and exploring nature in the vineyard within view. Summit Estate has bean bags for the kids to flop into inside and large grassy areas to run and play outside, all within view of the cellar door tasting, plus a lovely big undercover verandah area. Ballandean Estate has a younger kids activity/toy corner inside the cellar door. 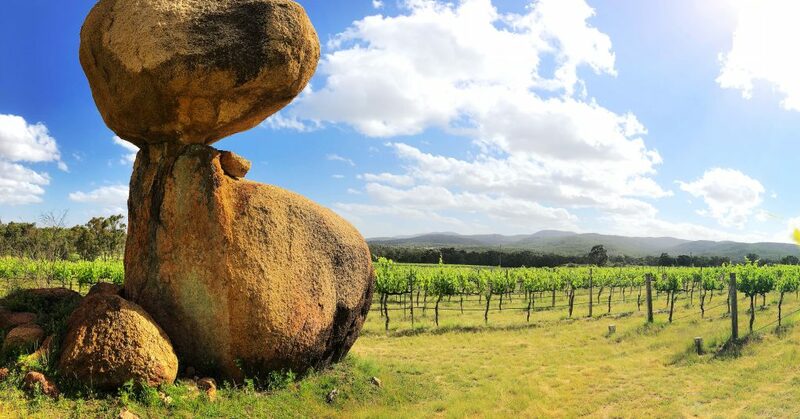 Balancing Rock Wines has a lovely vineyard walk to see the heart-shaped balancing rock (pictured above) right in the middle of their vineyard and outside at the cellar door is a lovely picnic table under the trees for kids to picnic (supervision required as a dam is nearby). View lots more cellar doors and wineries here. We’re always open to your own suggestions for which wineries you found most kid-friendly, so email us at marketing@kristahauritz.com.au for your own tips to add to this list! Get lost in the fun of solving a riddle, searching the giant Granite Belt Maze for clues. 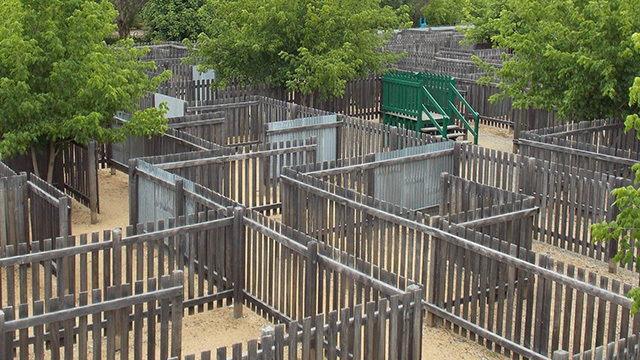 The maze is designed for family fun and is usually solved within about 2.5 to 3 kilometres of searching. Entry fees include one game of mini golf. Parents Tip: Be aware that food and drinks are required to be purchased on premises (water bottles permitted.) Food available for purchase: sandwiches & rolls, pies & sausage rolls, hot dogs, fish & chips, scones & muffins, ice creams & snack foods, coffee, tea and cold drinks. 17. Take a Steam Train Ride! Plan ahead and book on a day trip adventure on a historic steam train. 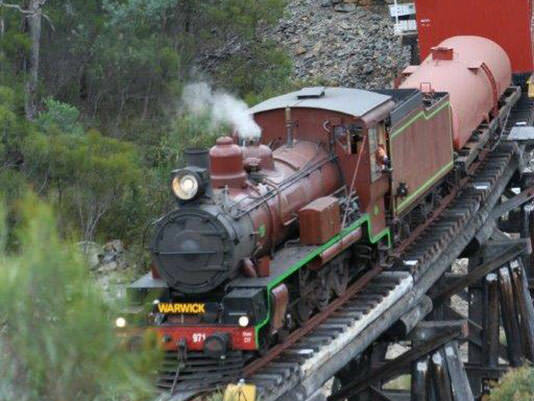 The one day trip from Warwick to Wallangarra and return is an exciting adventure and an amazing way to see the Granite Belt countryside, with a brief stop in Stanthorpe each way. Arriving in Wallangarra, you’ll find the Wallangarra Railway Station & Museum and a cafe with lovely dining on the the station platform. Find out when the next train tours are happening and book now. TOURS: Prices from $110 adult, $55 child. See Tour Options. Lawdogs Australia is a specialist dog training kennel where you can visit to see live shows, where puppies and adult dogs are undergoing law enforcement training and doing demonstrations of protection, detection and agility. Kids can get up close, while seated behind a safety fence and be captivated as they see the dogs barking on command, developing their bite skills, training for future arrest scenarios, controlling suspects, finding hidden scents and working around agility equipment. 31 The Rocks on the edge of Stanthorpe have a 2 bedroom cabin and it backs onto a bushwalk that leads to a private lookout with views that are just amazing! 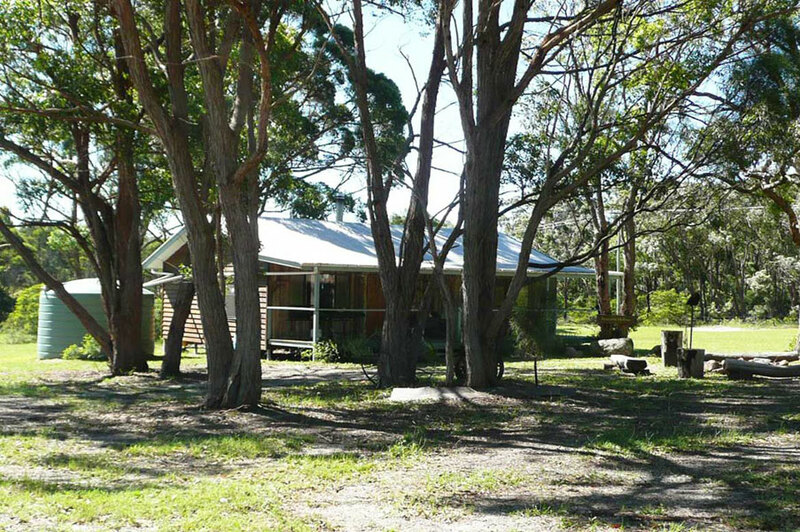 Possum Hollow and Hooters Hut are 2 bedroom cottages hidden away on 60 acres of scenic bushland. For a family stay right in Stanthorpe, check out Briar Rose Cottage’s newly renovated 3 bedroom Cedar Cottage, Connor House with stacks of beds and space suitable for a larger family or Lynrose Place with it’s 3 bedrooms and outdoor fire pit. There’s too many great options to name, so check out more accommodation here.